It has been a long time since my last post, now is time to catch up! 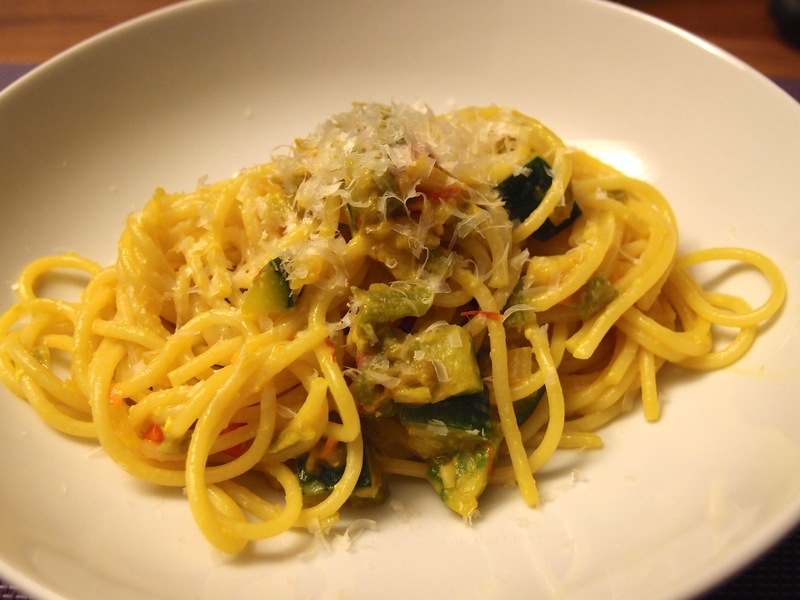 This almost a vegetarian version of spaghetti alla carbonara. This is because of the egg yolks you add at the end. pumpkin flowers (roughly a dozen). In a pot with boiling salted water cook the spaghetti till they are al dente. In a skillet warm up the oil and fry chopped onions, garlic and peperoncino. When the onion starts to get golden add the zucchini cut in small cubes. Let it cook it for roughly 5 minutes before adding the broth where you added the saffron. After a couple of minutes add the pumpkin flowers cut in stripes. When you prepare them remember to take out the stems. Put down the the heat to a minimum and add the egg yolks while mixing. Add the parmiggiano and keep mixing. In the meantime the spaghetti should be ready, add them to the sauce and you are ready to serve. Enjoy!